Sender is an email marketing tool used by thousands of companies from around the globe to deliver powerful and effective email campaigns, engage high-quality leads and turn them into paying customers. With Sender.net, devising professionally crafted emails is a breeze, thanks to its intuitive drag and drop interface. You can create stunning emails effortlessly and without any HTML expertise or experience. Sender comes with a vast gallery of pre-built email templates that you can use or create your own templates using your images and custom elements for that added personal touch. You can easily upload your products into your newsletters to effectively showcase your wares with just a push of a button. Your emails are also optimized for mobile platforms. That means your recipients are able to read your letters and your marketing content with ease using their smartphones and tablets anytime, anywhere. Sender.net is a simple and straightforward email marketing tool that is equipped with the tools and functionalities you need to create and send the perfect emails for sales and marketing purposes. 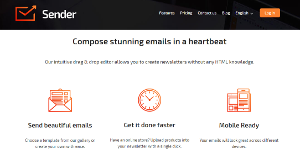 Its drag and drop email editor allows you and your team to prepare stylish, attractive emails in mere seconds and you don’t have to be skilled with HTML to do that. Preparing emails is a walk in the park as Sender.net supplies you with a wide selection of pre-built email and newsletter templates to get you started. Every template is customizable, letting you modify all aspects and tailor the template based on your requirements and preferences. Or if you prefer to use your own template, you can do that as well. When creating newsletters, all you have to do is choose and create your template and then tweak the elements, including text, images, and videos until you find the right mix and balance. To further increase engagement and conversion, Sender.net lets you personalized your newsletters to match your subscribers’ tendencies, preferences, and motivations. People are becoming more reliant on their mobile devices for communication and information. Emails created and delivered using Sender.net are optimized for mobile screens. That means your email campaigns can reach your subscribers and that they can access your content easily and quickly using their smartphone or tablet. It also allows them to perform your desired actions regardless of time and location. What Problems Will Sender Solve? Scenario 1: For most of the e-shops newsletter creation is a long process which takes a lot of effort. But let’s face the truth – it gives quite a reasonable revenue in return. Preparing nicely designed templates, and including lots of products with good-looking pictures and best prices is a challenging process. For that particular reason, Sender’s team created a special The Magical Way to save at least 50% of time on creating newsletters and special deals. The Magic is pretty simple actually – with pre-made custom integration for e-shop owners the magic button appears. From now on, to create stunning newsletter is as simple as: 1. Choose a template from the Free Library 2. Add your branding 3. Include your products to the newsletter as simply as pasting the URL into the special field 4. BINGO – it’s done. All of the main products info, like Price, Title, Description, Photo, Discount, etc. – appears automatically. Scenario 2: Have you ever wondered about starting your own blog? Or how many of you had an idea to start your own e-commerce business as a site project or even as a hobby? It’s pretty obvious that starting a new project might cost a bit, but when you have to pay a bunch of money only for sending emails – it’s a heart-breaking deal. In order to encourage news bloggers, e-commerce businesses, and other people to achieve life goals, Sender launched the Free-Forever plan. They’ve got your back with emails in the beginning, so you don’t pay until you’re able to. They also allow you to use all of the Sender.net features and services (pssst. including transactional emails) For Free until you reach 2500 subscribers in your database. You can send up to 15.000 emails every single month. If you don’t like it, or the project is not going well – just leave it, no hard feelings or commitments. Scenario 3: You just created three A/B/C Newsletter campaign, worked hard to gather really hot leads on your website, setup automation workflows out of 5 different offers for different segments, just spent 12 hours while working on that, missed your favorite sports team tournament and had only fast-food for lunch. But it’s all done. Click on SEND. And nobody opens it. Nobody reads the masterpiece, which you were creating for so long. Then you find out – it landed on a SPAM folder. You lost hundreds or even thousands of potential revenue. Try to think of the least bad word you would use, ah? While the Spam filters now are more aggressive than ever, they check hundreds of different factors, including IP reputations, content sent before and lots of other data. Since Sender doesn’t let even a single SPAM email go out through Sender.net servers, the team can brag about excellent reputation. In this case, they could fight for the best deliverability possible and provide it to their customers. Moreover, for customers who exceeded 50,000 subscribers, Sender offers a dedicated IP. You don’t have to share it with anybody, so nobody has even a theoretical chance to decline your reputation. Enterprises have unique wants and requirements and no software solution can be just right in such a situation. It is useless to try to find an ideal out-of-the-box software system that meets all your business requirements. The wise thing to do would be to adapt the system for your specific requirements, staff member skill levels, budget, and other aspects. For these reasons, do not hurry and invest in well-publicized leading applications. Though these may be widely used, they may not be the ideal fit for your specific wants. Do your research, check out each short-listed platform in detail, read a few Sender reviews, speak to the vendor for clarifications, and finally select the product that presents what you want. How Much Does Sender Cost? We realize that when you make a decision to buy Email Marketing Software it’s important not only to see how experts evaluate it in their reviews, but also to find out if the real people and companies that buy it are actually satisfied with the product. That’s why we’ve created our behavior-based Customer Satisfaction Algorithm™ that gathers customer reviews, comments and Sender reviews across a wide range of social media sites. The data is then presented in an easy to digest form showing how many people had positive and negative experience with Sender. With that information at hand you should be equipped to make an informed buying decision that you won’t regret. What are Sender pricing details? What integrations are available for Sender? If you need more information about Sender or you simply have a question let us know what you need and we’ll forward your request directly to the vendor.